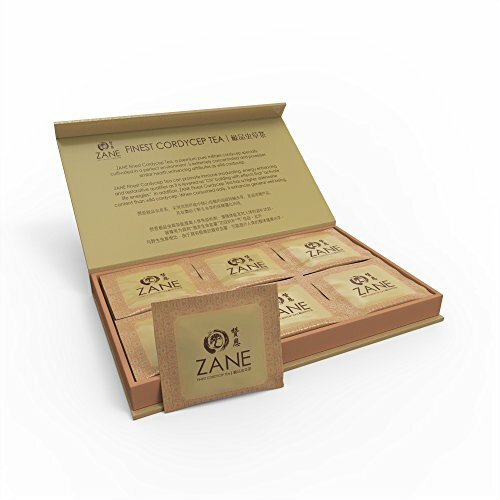 ZANE Finest Cordyceps [One month supply: 30 sachets]: BLACK FRIDAY SALE by ZANE at Rae Of Sunshine Life. Hurry! Limited time offer. Offer valid only while supplies last. ZANE Finest Cordyceps Tea is a premium 100% Militaris Cordyceps, uniquely cultivated with patented technology from best species of Tibetan Cordyceps. ZANE Finest Cordyceps Tea is a premium 100% Militaris Cordyceps, uniquely cultivated with patented technology from best species of Tibetan Cordyceps. A highly concentrated Superfood with 3-6 times higher active ingredients (Adenosine and Cordycepin) than wild cordyceps (backed by Singapore test report). Experience gourmet tea with premium flavour and great benefits, we know there's a perfect cup for every moment. Whether you need to feel rejuvenated to get you going or looking for the perfect health tonic, this tea is specially made for you. This patented and proprietary formula provides a foundation for a healthy life: full of vitality and energy that helps improve your health today and throughout your life with superior benefits. PROMOTES GOOD HEALTH: Excellent tonic for heart, liver, kidneys and lungs. Aids in vitality and immune support. SAFETY: GMP Quality Standards. ISO 22000 & HACCP Food Quality System Certified. Product of Singapore. If you have any questions about this product by ZANE, contact us by completing and submitting the form below. If you are looking for a specif part number, please include it with your message.